Amherst is a “very attractive town,” Communities in Bloom judge Judith Cabrita said in a recently released report containing the results of her inspection of the town. Cabrita inspected the town on Sept. 13 for tidiness, environmental action, heritage conservation, urban forestry, landscape and floral displays. She gave the town “four blooms” for achieving an average mark of 75.2 per cent in those areas. It’s been several years since the town has undergone an inspection by Communities in Bloom and it was first inspection since a new, revitalized local Communities in Bloom committee was established earlier this year. Recreation director Bill Schurman said receiving such positive feedback from the judge was encouraging considering the steps the town has taken to improve the quality of its green areas and parks. He attributed the success to Chelsea Baird, the town’s horticulturist and maintenance staff, as well as the revitalized, 10-member local Communities in Bloom committee, which Baird chaired this year. 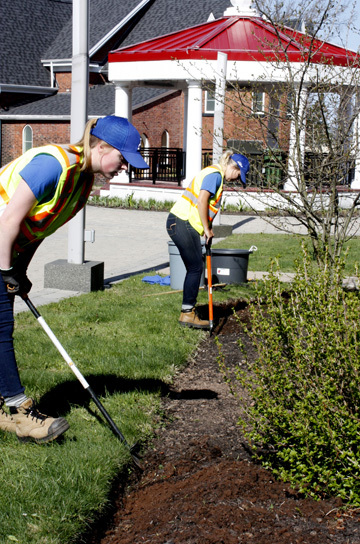 Cabrita also applauded the town’s commitment to urban forestry, ensuring a “cared-for environment, particularly in the centre core area of town and for the floral displays around town. To read the report go to amherst.ca/recreation-department.html.